The Catered Affair at the Boston Public Library Launches Our New Website! Ever wanted a peek into what it would be like to have a wedding or a corporate event at The Boston Public Library? Curious about the menus and specials going on at the library's very own dining spot, The Courtyard Restaurant? With our newly redesigned website, The Catered Affair at the Boston Public Library is giving you unprecedented online access to the weddings, corporate meetings, galas and events that we have at the Boston Public Library, as well as insight into the library's room and event options for those considering planning an event with us. Ever wanted a peek into what it would be like to have a wedding or a corporate event at The Boston Public Library? Curious about the menus and specials going on at the library’s very own dining spot, The Courtyard Restaurant? 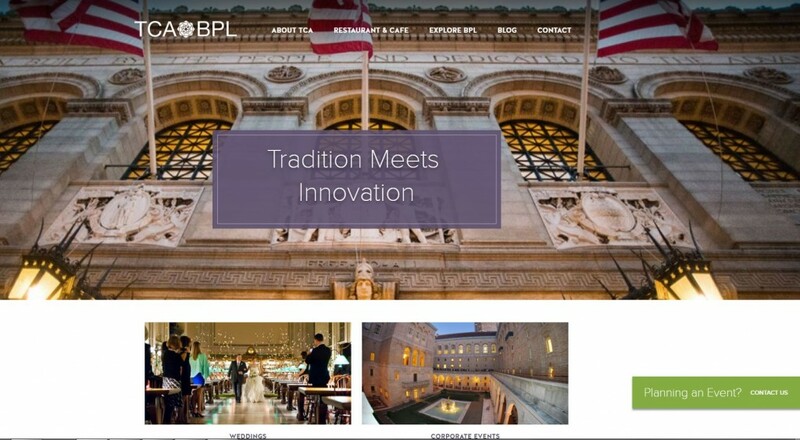 With our newly redesigned website, The Catered Affair at the Boston Public Library is giving you unprecedented online access to the weddings, corporate meetings, galas and events that we have at the Boston Public Library, as well as insight into the library’s room and event options for those considering planning an event with us. So take a few moments to get lost in the gorgeous events that The Catered Affair at the Boston Public Library has planned. Explore the library’s many event options, check out our delightful sample menus and feast your eyes on photos of over-the-top beautiful events. Visit our new website today!